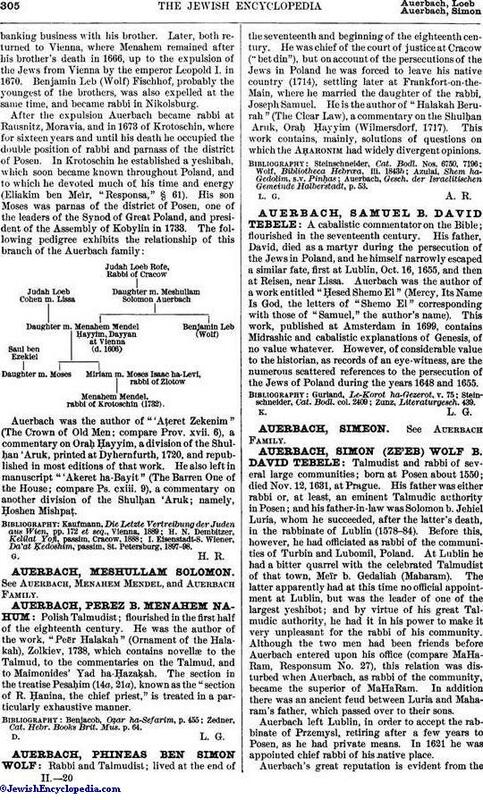 Rabbi and Talmudist; lived at the end of the seventeenth and beginning of the eighteenth century. He was chief of the court of justice at Cracow ("bet din"), but on account of the persecutions of the Jews in Poland he was forced to leave his native country (1714), settling later at Frankfort-on-the-Main, where he married the daughter of the rabbi, Joseph Samuel. He is the author of "Halakah Berurah" (The Clear Law), a commentary on the Shulḥan 'Aruk, Oraḥ Ḥayyim (Wilmersdorf, 1717). This work contains, mainly, solutions of questions on which the Aḥaronim had widely divergent opinions. Auerbach, Gesch. der Israelitischen Gemeinde Halberstadt, p. 53.